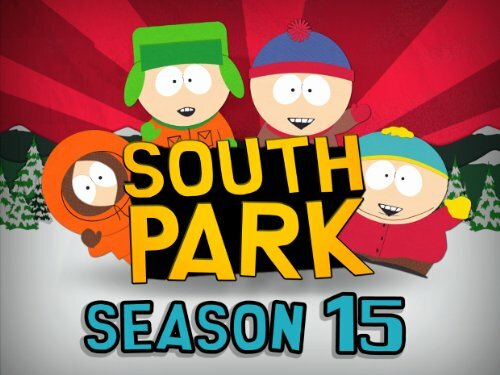 (S1501) In what has to be one of the most amazing season openers from a South Park season ever, Matt Stone and Trey Parker prove their genius yet again by merging the concept of the iPad and a terrible movie called Human Centipede. This main story arc involves Kyle and a couple undescript residents, while the other storyline focused on Cartman and his lack of an iPad. As a side note, the only reason I know about Human Centipede is because of @danieltosh and his Tosh.0 series which featured a brief segment on it. The concept of Human Centipede is that multiple people are connected in a terrible fashion (read more on IMDB -- looks like there will be a Part II). how was this even financed? It is possibly one of the worst things I have ever seen. However, South Park has managed to transform this godawful concept to unbelievable heights. After downplaying a claim by a teacher that Apple records all location tracking information, several "Apple G-Men" suddenly show up to take blood and other samples from Kyle, and then rush him off to a an Apple prison. Kyle is thrown into a prison cell that looks like something out of Silent Hill, along with two other people who will all become the HumancentiPad, Steve Jobs' next vision of the future of technology. The various sequences involving the the connection of all three people and the gastro-intestinal humor surounding it are better experienced than explained, but suffice to say that no one can fight the power of an amazing burrito... no one. Even better is the sequence involving the Genius Bar. In an effort to get Kyle back, the gang head to a Genius Bar to retrieve him, but the Geniuses simply want to supply an alternate. This of course is unnaceptable, so the Geniuses convene in a "Quickening." Seriously, the references in this episode are amazing, like all other seasons. I loath going to the Genius Bar -- as I suspect many others do as well -- and this sequence captures my feelings quite succinctly. Cartman's story centers around his lack of a real iPad, and in his attempts to get one he makes his mom out to be a child molester, even going so far as to appear on Dr. Phil. He has some classic one liners like many other episodes, which mostly revolve around him "getting f--ked" by his mom. Of course the major social commentary focuses on the recent reporting about Apple's GPS data and the perceived elitism of owning Apple products. To be fair, I have an iPad, but to balance things out I also use an Android. At least I can give my data away to two companies instead of just one, right? It was a great start to the new season all in all, and I can't wait to see what the South Park boys have in store to top this. That may have been the most disturbing episode of South Park that I have yet seen... and that is saying a lot. Therefore it may well reveal something of my own soul to say that I found it hugely hilarious as well. And it was classic South Park in the sense of operating on multiple levels of comedy and subversive commentary at the same time. Best of all: it plays off the premise -- absolutely correct at that -- that no one reads the incessant iTunes agreement updates. This was the funniest episode of the year. I could'nt stop laughing when the guy crapped in kyle's mouth.